We started as kiteboarding business in 2007, and in 2009 I decided to move to SUP only. Our location here wasn’t well suited for kiting, but offers endless opportuntities for SUP. We have waves and all kinds of flat water, from coastal exploring to endless kilometers of rivers, and even whitewater. We are still very small, I operate from my van and garage, and are open from April til December. I’m also the Jimmy Lewis sales rep for Atlantic Canada. I got my first boards from Jimmy Lewis back in 2008, even before there was a Canadian distributor, and sold a couple through word of mouth. I also had Ocean Rodeo drysuits and accessories. This year I expanded our line to include RogueSUP, and Grey Owl Paddles. The Jimmy Lewis Cruise Control is my best seller, and I think the RogueSUP Tesoro will be a winner this year. The Grey Owl Wave Rider is my best seller, nice paddle at a good price point, and the Jimmy Lewis Kanaha. You have to have a leash, even for flat water. We offer free lessons with the purchase of board, free demos, and we are doing rentals this summer. If we get enough interest I’m hoping to do a Wednesday evening group paddle, just like the old windsurfer days. Meet up for an hour or so of paddling then a cold beer, or beverage on the beach. Right now we mostly in the surf in the Bay of Fundy. Flat water on the Saint John and Kennebecasis Rivers. Early morning, and evening, or anytime the surf is good depending on the tides, which are 28ft here. 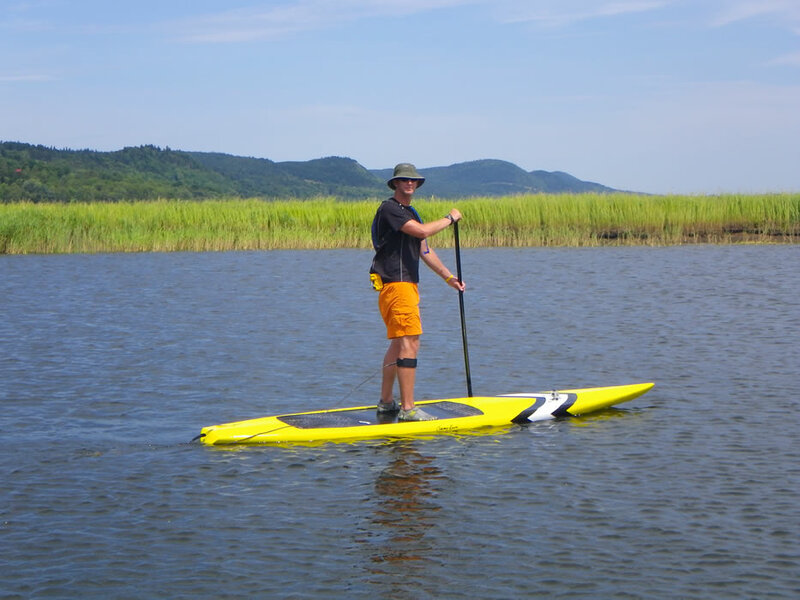 I think in our area it will be an equal growth in the SUP surfing and flatwater paddling. I can see a Wednesday evening summer race series developing as the sport grows in popularity. Something fun and easy going. I love it all, early morning surf sessions in the winter, calm summer days on the river, or late summer surf sessions wearing only a boardshorts and a neoprene top. It’s all good. The biggest thrill is watching new people getting out on a board for the first time, and loving it. Don’t go too cheap on gear, you get what you pay for. Get a good quality board, and get the best paddle you can afford. 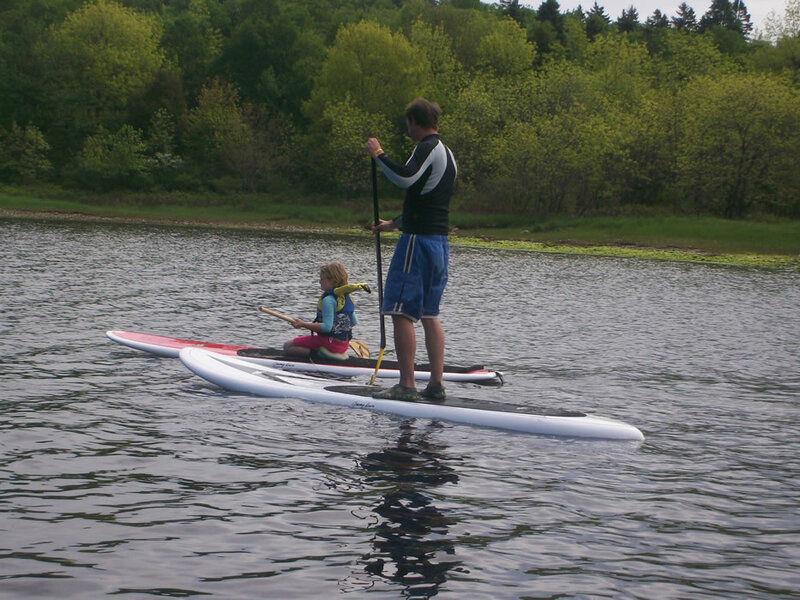 Don’t forget to look up, and not down at the board when paddling you’ll keep your balance a whole lot easier. 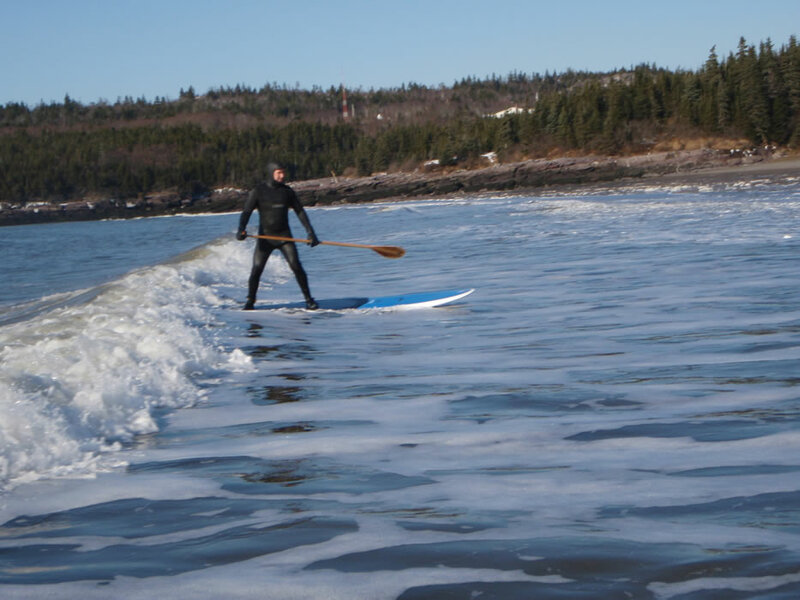 We are in the early stages of planning a group paddle/event from New Brunswick to Prince Edward Island for later this summer. It’s about 15km. I don’t think it’s ever been done before from one province to another. The world needs more shops like Terry’s that help spread the word and the stoke about standup paddlesurfing. Keep up the great work Terry! Nice overview of the business and the sport! Can you recommend a board suited to a middle age sporty girl like myself? Thanks for the nice comments Lee, appreciate it. Angie, I think a nice Jimmy Lewis Albatross would be a good board for you, or maybe a nice pink board for a sporty girl. I suppose you want the family discount too? hey! great website but where are you loctaed in NB? I really want to take up sup this summer. I am in school and dont have a lotof extra money to invest. any suggestions? maybea surf board? idlove to meet and paddle board with others this year. where do ifind you?